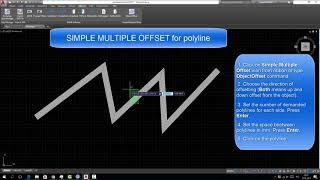 The default Autodesk® AutoCAD® command OFFSET makes only one offset. The Simple Multiple Offset helps to create many offsetted objects from the one reference object. The user can set the number of demanded objects, space between the objects and the direction of the offset. This plugin works with lines, polylines, circles, rectangles and ellipse.